WHERE: This year's festival is taking place at The BIG Theater, the new home of Baltimore Improv Group, and we want you to be there! Also, for the first time ever, BIF is adding a second venue -- the lower-level performance space at Joe Squared (33 W. North Ave.), our neighbor in the Station North Arts & Entertainment District. 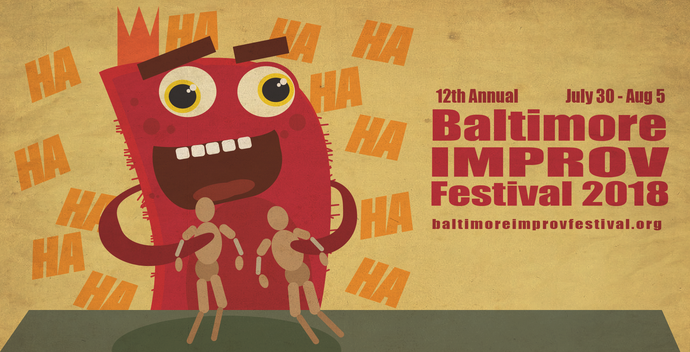 For the 12th year in a row, the Baltimore Improv Festival (BIF) brings you the best improv comedy from Baltimore, the East Coast, and beyond! This year we have teams from New York City, Washington, Philadelphia, Pittsburgh, Dallas, and more! 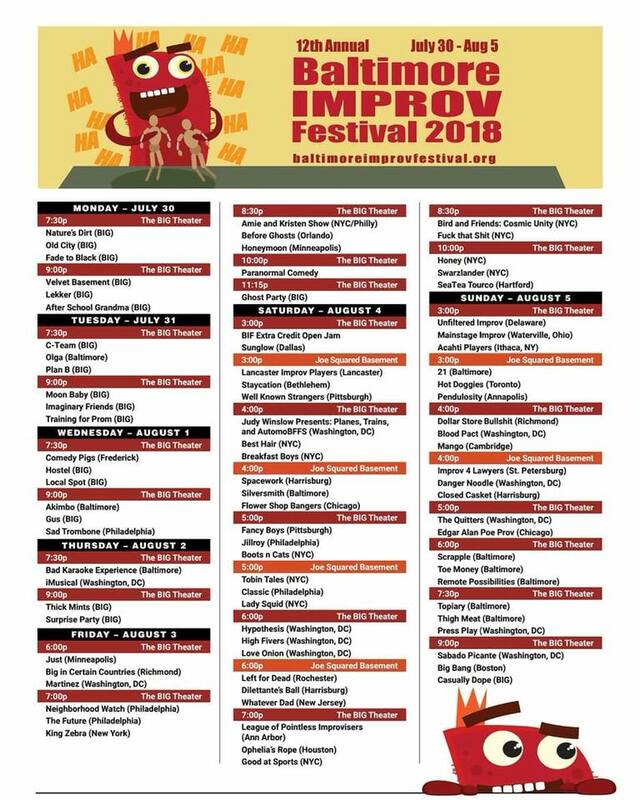 BIF offers seven whole days of shows for fans and a weekend full of workshops for beginner to more experienced improvisors. Please join us—You'll never want to leave! The C-Team - Founded in 2018, The C-Team performs regularly at The BIG Theater as part of the Baltimore Improv Group's Conservatory program. OLGA - OLGA is a Baltimore-based indie comedy duo comprised of Jen Diamond and Pam Hugi. Formed in 2014, OLGA performs long-form improv, original sketches, and duo-stand up. OLGA has performed in Baltimore, DC, Philadelphia, and New York. Both Jen and Pam love their moms a lot. Plan B - Plan B is the longest running troupe in the Baltimore Improv Group's comedy arsenal. Expect short form (Whose Line is it Anyway?-style) games with high energy, big characters, and major laughs. Moon Baby -- We're out of this world...and could use a good cuddle. Imaginary Friends -- When you're doing improv, you are surrounded by as many friends as your mind can handle. Imaginary Friends will take your suggestions and create new worlds you never knew could exist. Training for Prom -- Training for Prom performs long-form improv that’s at once familiar and bizarre. This puckish troupe combines whimsy with emotional connection to bring you along for a ride that flips reality through the looking glass. They have performed in the Charm City Fringe Festival, Providence Improv Fest, Big Pond Improv Fest, and the New York City Improv Festival, as well as the Baltimore Improv Festival.